See if you can resist this Rawa Khaman Dhokla. Just look at the dhokla picture below. Your mouth is bound to water. Dhokla is a popular Gujrati dish. Dhokla is usually made with besan - chickpea flour. Try out this yummy variation. You can have it as anytime snack or breakfast or as a side dish for a meal. As it doesn't need to be served hot, it is convenient to make and keep and serve when you want. Take it for a picnic or serve it for a party as a side dish. Take rawa, curd, salt and soda mix well and keep for one to two hours. after that pour the mixture in a plate and steam for 15mins. Cool and then cut in a square pieces. - take and heat oil in a pan. 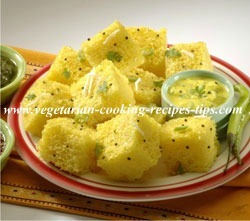 - add mustard, hing, curry leaves, green chilli, turmeric powder, red chilli powder, salt and cut dhokla pieces. Mix lightly. Finally garnish with the coriander leaves. Tips: it gives better taste with khati mithi pudina chutney. Here is another dhokla recipe for you. I want this dhokla NOW!